Karen is a Stride member and owner of the juice bar Whey to Go in Marietta, Georgia. You can follow her @whey2goagain. Hi, Karen! Would you mind telling us more about your background? Karen: I've been the owner of a juice bar, Whey to Go, for two years. Prior to this, I was deeply involved in the healthcare industry. I worked as a Community Outreach Coordinator for Enroll America. We trained volunteers to host enrollment events in lower income communities and spread the word about the importance of affordable healthcare. Was the outreach on a volunteer basis or was it a formal, nine-to-five job? Karen: It was never a nine-to-five because we had to literally knock on doors in the community, so we had to be respectful of people that were working. I was a volunteer in California for several years before moving to Georgia. I was then formally hired to work on promoting the Affordable Care Act and hosted enrollment events to make sure that people knew where they could enroll. I did that as well here in Georgia. How did you get the idea for moving from this activism-outreach space into a more brick-and-mortar, nutrition-based store? Karen: I’m always thinking along the lines of healthcare—that's been my theme for a good 15, 20 years. I’m always doing something to make the environment healthier for myself and others. My mom is here in Georgia and she's just turned 80 in April, and I want to make sure that somebody from the family is close to her, so I knew I was going to make the move from California to Georgia. In California, we're very health conscious in general, and here [Georgia] there's just a lot of good eating and a lot of meetings held over dinner, like shrimp and grits. So I just said, “I need to really hold myself accountable and make sure that I stay healthy.” I started working at LA Fitness as their Operations Manager.In this role, you’re responsible for everything in the gym. Every time a basketball went flat, every time the pool wasn’t at the right temperature, that was my top priority. I wanted to do something that was less stressful, so I worked at the juice bar and was able to transition into owning my own juice bar inside LA fitness, which is what I've been doing the last two years. That's awesome. It seems like at least part of the reason that you decided to transition from your previous role as Operations Manager to owner of your juice bar is having the ability to set your own schedule and priorities. Is that correct? Karen: Yeah. I definitely like to be in control, and I was able to do that even in my prior position helping people enroll under the Affordable Care Act. Having more control over the hours I work and how successful things are definitely played a big part. I'm in a great environment in that everybody surrounding me is already in fitness mode. My top priority is to figure out what they need, whether it be energy to do it, fluids to get through it, or protein to recover from it. My staff loves that they get free membership as part of their employment. Working with Stride is a great partnership in that we can also offer great health options to our staff as well. Karen: We open at 7 in the morning. We time our hours to compliment the group classes at the gym, so we sell lots of products for dehydration during the morning hours. We set up protein bars, the wheatgrass juicer, the blenders, etc. and get ready for any and everything. Each day is different--that’s what I love most about it! We close during the slowest time for lunch, but open back up at 4:30. That’s when we see most of our regulars who are usually looking for energy and meal replacements. They come after work and really want to get energized. We have meal replacement shakes that our customers love to have for dinner. The Green Goddess is a gym favorite; it comes complete with spinach and loads of fruit. 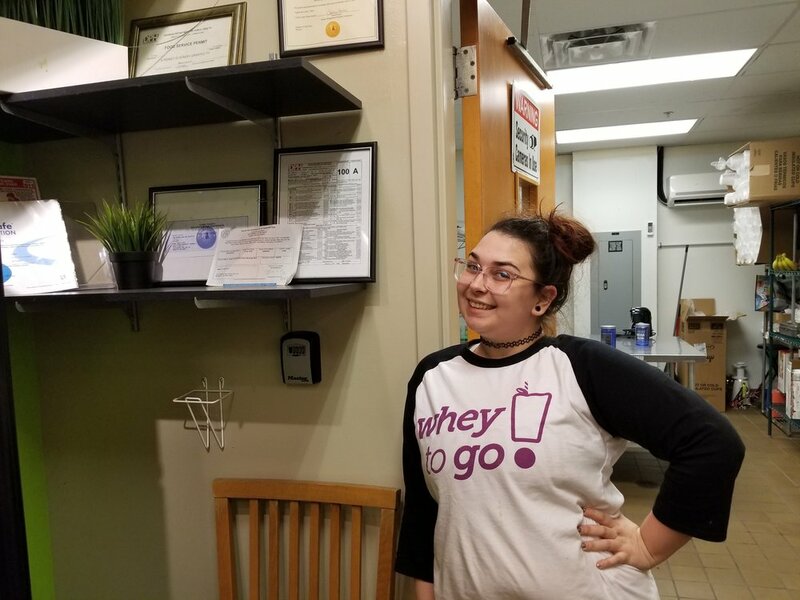 Whey to Go closes at 8:30 p.m. or when we’ve served our last customer of the night. 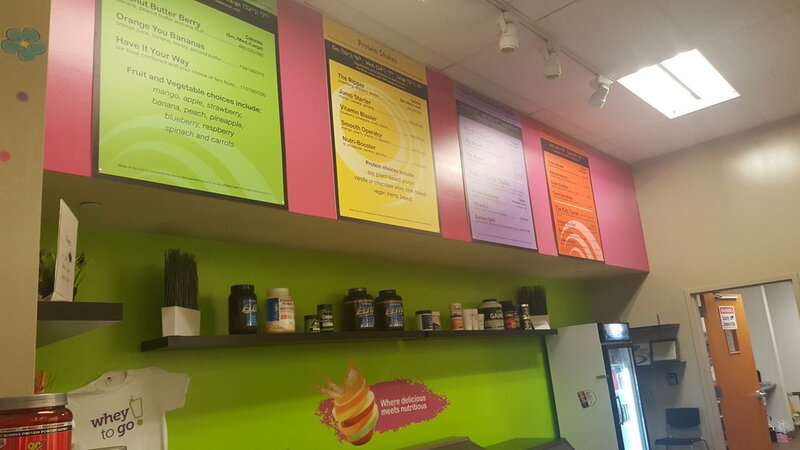 What kind of products do you sell specifically at the juice bar? Karen: As our name suggests, most of our products have whey protein in them. It comes in several forms, including bars, shakes, and supplements. We also have healthy snacks, such as fruits and vegetables that we incorporate into some great protein shakes and smoothies. We really try to provide healthy options that are great for your immune system and a good source of Vitamin D, such as Mushroom Coffee. We have ‘Mushroom Mondays’ where we give people a chance to sample some of our Mushroom supplements. Wheatgrass Wednesday is our most popular special; we offer half off of a shot of wheatgrass. We love introducing new ways to eat healthier. What did you struggle with the most when you became self-employed? Karen: I guess it would be trying to comply with Georgia’s rules and regulations. It’s a lot more than you’d think! The fire marshal had to come in and inspect, the food inspectors come in—there are so many rules and regulations. That's been the hardest struggle. I thought I knew a lot based on what the manager of the previous juice bar that I managed told me, but when you make the transition and you actually are the leader in the front, that's when all the surprises hit you. Quarterly sales predictions, monthly sales taxes, annual business taxes, the list goes on and on. Yes, that would be what I struggled with the most. What kind of plans do you have for the future? Do you see yourself running this juice bar for the foreseeable future? Are you thinking of expanding into other fitness gyms or expanding the brand? Karen: Yes! This year we're going to be franchising into the food truck industry. It's called ‘Whey to Go on the go’ and the truck will just offer the juices. It's a way for us to transition away from LA Fitness because there is a substantial amount of rent that we have to pay for that space. This way we have the flexibility of going to an Essence Festival or Renaissance Festival or any of the gazillion summer festivals that are going to be taking place. If we expand as I plan to, we want to have a spinoff of the ice cream truck, but instead be the healthier option with protein shakes and fruit smoothies.